From planting a small flower garden to sprucing up your outdoor furniture, many of these projects will take you less than a day to complete and some may not cost you anything at all if you have a few basic supplies on hand. Go ahead and get ready for summer by adding some beauty to your outdoors. 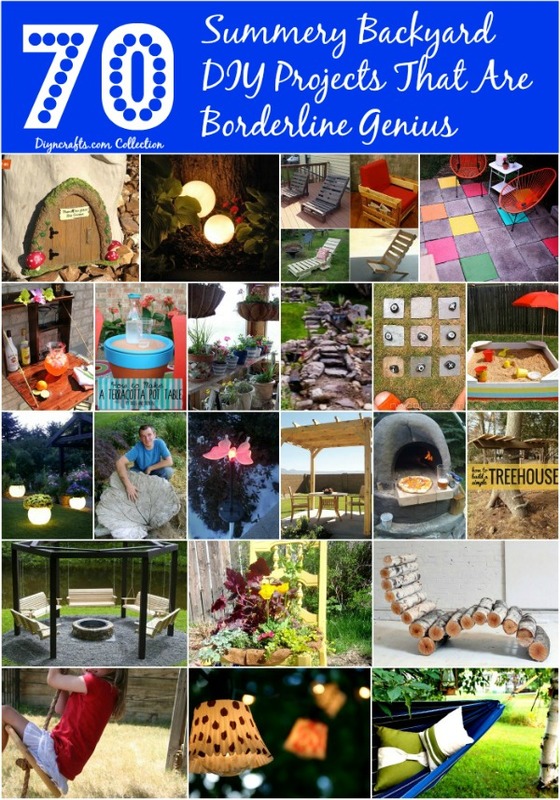 From DIY stepping stones to marvelous outdoor patio furniture that you can make yourself, this collection has it all. There are even instructions for how you can add a little color to a stone patio and wonderful ideas for dressing up boring fences and adding a bit of privacy. Whether you choose on project or choose them all, we are certain that you will find something that will instantly improve your outdoor décor and give you a great reason to get outside this summer. If you want something really fun, not to mention cheap and easy to build, you can make a giant xylophone for your little ones. 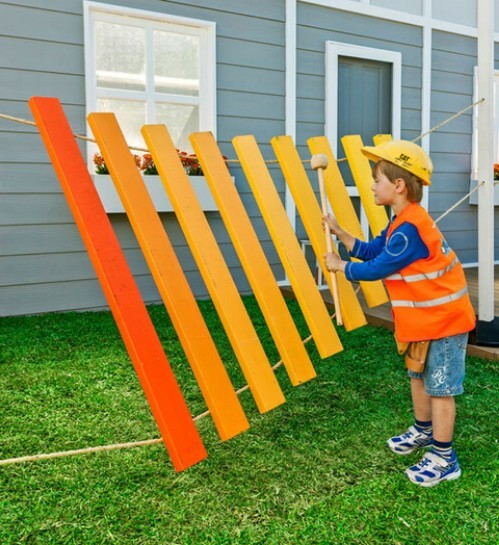 They will have hours of fun making music in the backyard and since xylophones are generally different colors, you can brighten up your outdoors just a bit. This is such an easy project that just calls for pine boards, paint and rope. You’ll also need a staple gun and you can build it in just a few hours. Imagine the fun your little one will have putting on an outdoor concert for you. 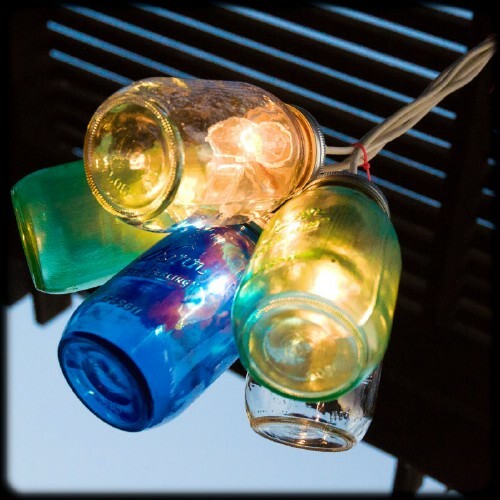 Whether you are planning a summer evening get-together or you just want to add a sweet little decorative element to the backyard, these cupcake lights are divine. You just run a string of lights and then cover the lights with cupcake liners. Note that for outdoors, you’ll need to remove the liners whenever it rains but these are great for outdoor entertaining. You can use different colors and designs or just make them all the same. 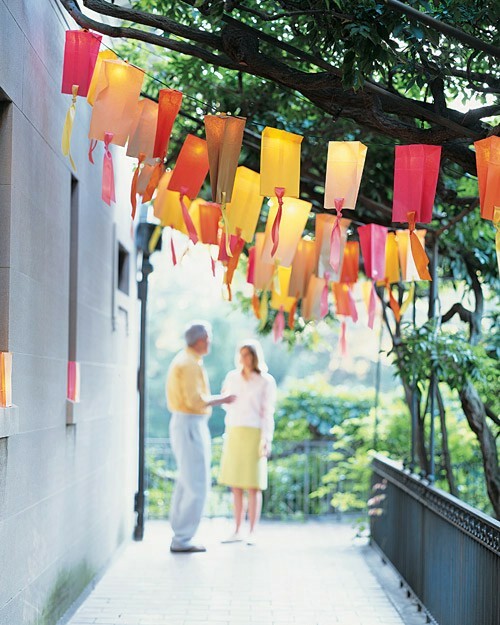 It’s a sweet way to decorate your outdoors without spending a lot of money. 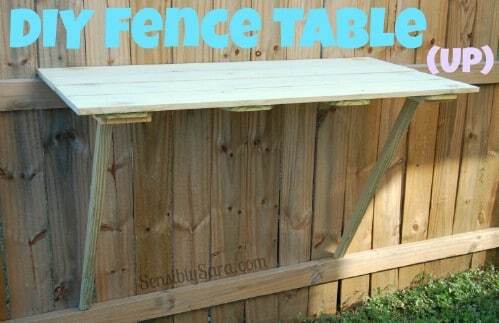 For under $30, you can build a great table on the fence that will work perfectly for outdoor cookouts or putting your indoor plants out in the sun. The table folds down when not in use so it’s really not in the way. You just raise it whenever you need it. You’ll need some hinges, screws, a board for the legs and picket boards for the table. Note that if you want it to last outdoors for several years, you may want to buy pressure treated lumber to build it. You can make your backyard trampoline much prettier (not to mention safer) by cutting pool noodles and inserting them around the edges on the springs. Pool noodles are about a buck each at the Dollar Store and you won’t need very many. Just cut them the length needed to cover the springs and then make a slit on one side to insert it. 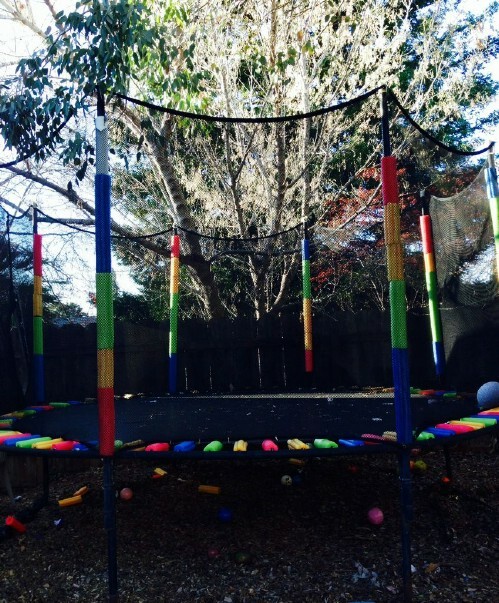 If your trampoline has a net, you can also cover areas of that and make it really rainbow-ish. 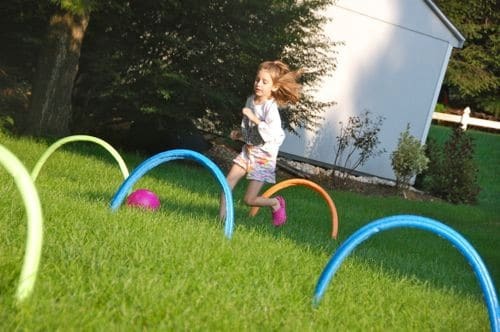 This makes it much safer for little ones who may get hurt on metal springs and it brings a lot of color to your backyard. This is one of the most unique and least expensive ways to pretty up your flower gardens. It gives you a lot of added planting space as well. 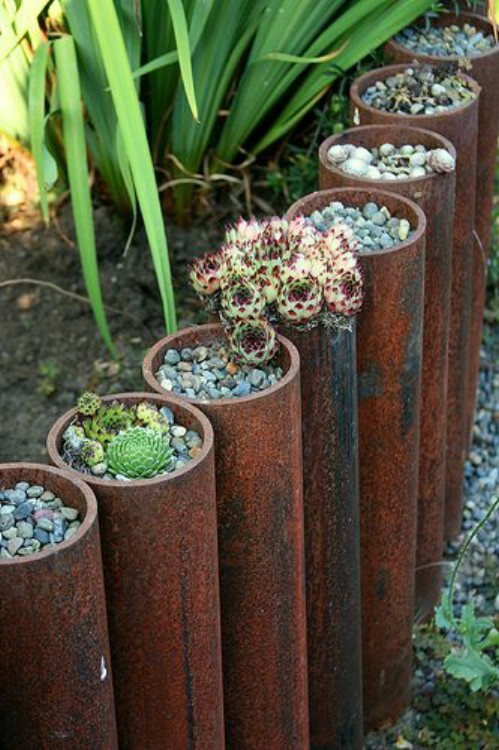 You just take old steel pipes and insert them into the ground around your flower bed. Then just fill the inside of the pipe with potting soil and use that to plant smaller flowers or succulents. You can actually paint the pipes first with spray paint if you aren’t a fan of the old, rusty look but either way, this is a beautiful way to frame your garden and add some extra space as well. If you have unsightly tree stumps in your backyard and you either don’t want to have them pulled or the process is a bit too expensive, you can turn those stumps into decorative aspects. Simply build a gnome home in them. You just need a tiny door and windows and then whatever you want to decorate the little home with. 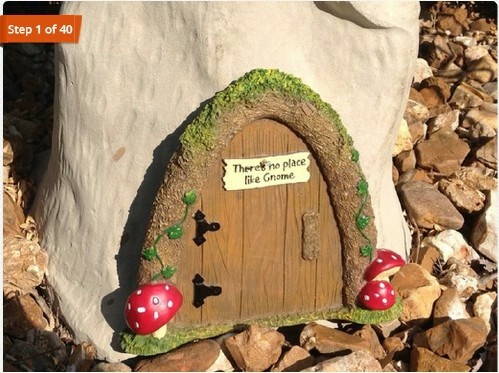 These are so adorable and if you have garden gnomes, they’ll have a great place to call home. They will turn those unsightly stumps into great décor that is bound to be the envy of all your neighbors, or at least their gnomes. 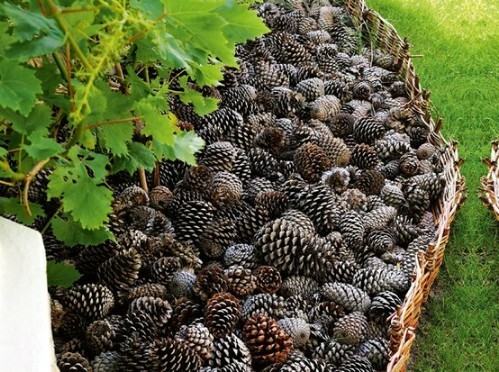 Pinecones are probably among the least of all mulch type products because you can normally find them on the ground just about anywhere. Not only do they help to add a bit of beauty when you add them to flower beds, they will also keep dogs and cats from digging in your beds. You just gather up as many as you need and then fill in the ground around your flowers with them. Dogs and cats will stay far away from your flower beds and you’ll have a great decorate element to make those flowers really stand out. You can find opaque glass shades at most flea markets and thrift stores for a couple of dollars each. Take a string of Christmas lights and you can turn those shades into amazing glowing orbs that will help to light up your outdoors. This is one of the least expensive lighting DIYs out there and one that is absolutely beautiful when it’s finished. You can probably find Christmas lights pretty cheap at yard sales and such if you don’t already have a few strands on hand so these will cost less than $5 to make. 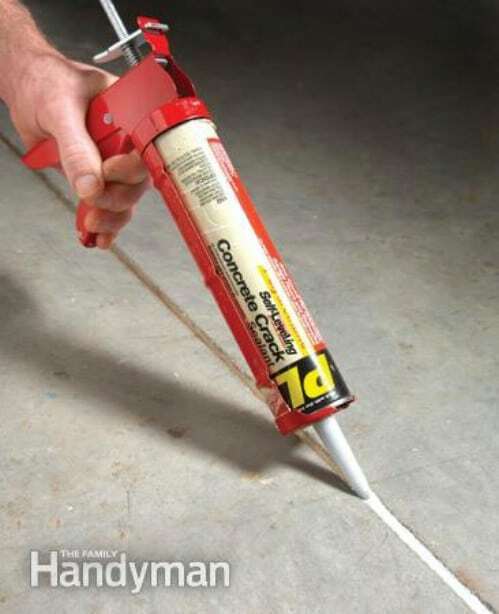 You can buy self-leveling caulk for about $6 per tube and one tube will go a long way in helping you to improve the look of your backyard. If you have cracks in concrete, either the foundation of your home, steps, walkways or any other concrete, those cracks will allow weeds to sprout and they look terrible. For just $6 you can fill in the cracks yourself, save a lot of money over having them professionally repaired and make your backyard look wonderful for summer. 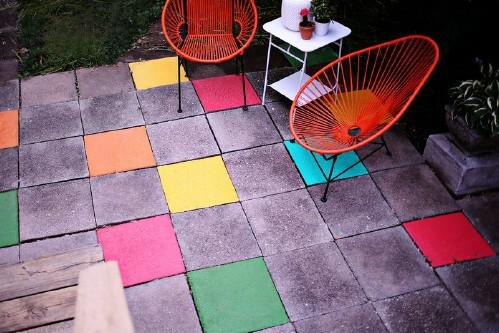 It will cost very little and take very little time to add a bit of color to your patio. If you have a tile patio, you can simply paint a few of the tiles in bright colors, which will instantly add an interesting element. Choose colors that will match your home’s exterior or your patio furniture. This is a great way to bring a bit of the tropics into your backyard for summer and since it’s cheap and easy, it’s one of our favorite backyard DIYs. 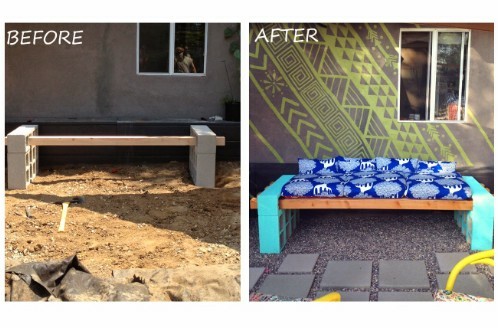 With just a few cinderblocks, a few pieces of lumber and some cushions, you can create a beautiful and very comfortable couch for your backyard. You just have to stack the blocks and insert the boards through the holes. You will want to use concrete adhesive to ensure that they don’t fall when someone sits on the couch. Then just add a cushion or two and you have a wonderful couch that is both attractive and cheap to build. It’s also really easy. It should only take an hour or so to complete or longer if you are planning to make the cushions. Not only will this terra cotta smoker look attractive in the backyard, it will be a wonderful way to cook during the summer months. 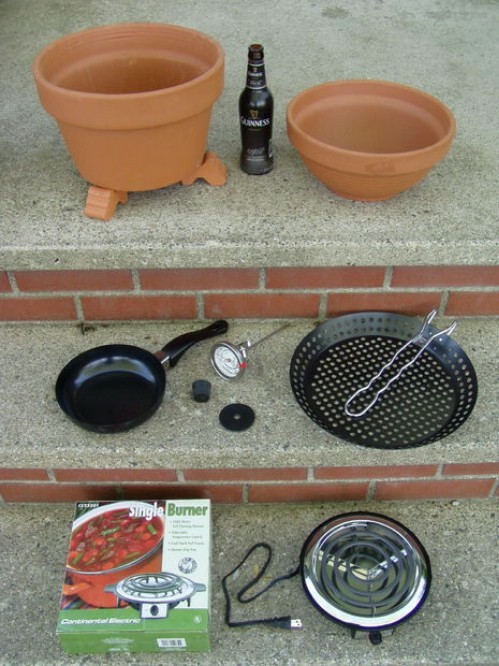 You can build the smoker completely from scratch with just a couple of terra cotta pots and an old single burner hot plate. You’ll also need a skillet and a few other supplies but overall, this is a really inexpensive smoker and it works great. It’s also really attractive since the outside is made from terra cotta pots so it’s perfect for the back deck or yard. A few pebbles (which you can get at your local home improvement store) and some glow in the dark paint will help you to fill in cracks between your stepping stones and give you great outdoor lighting at the same time. 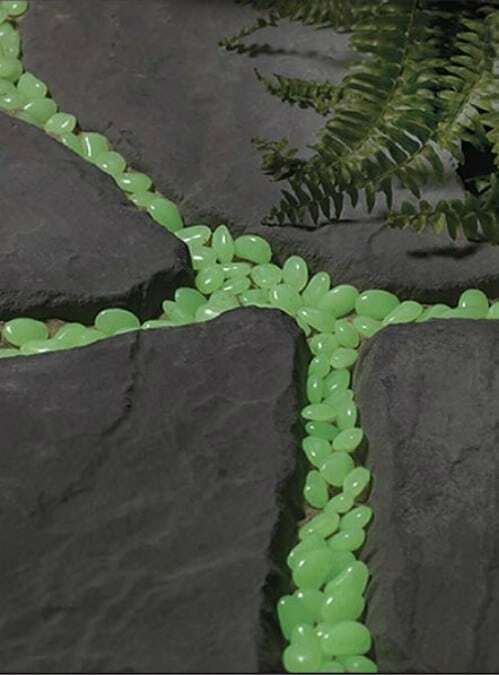 Instead of filling in those cracks with mulch or worse, letting weeds grow up through them, just paint some pebbles with glow in the dark paint. The sunlight during the day will fuel the pebbles and they’ll glow for several hours at night. You can find glow in the dark paint in all sorts of colors so you have many choices for décor. 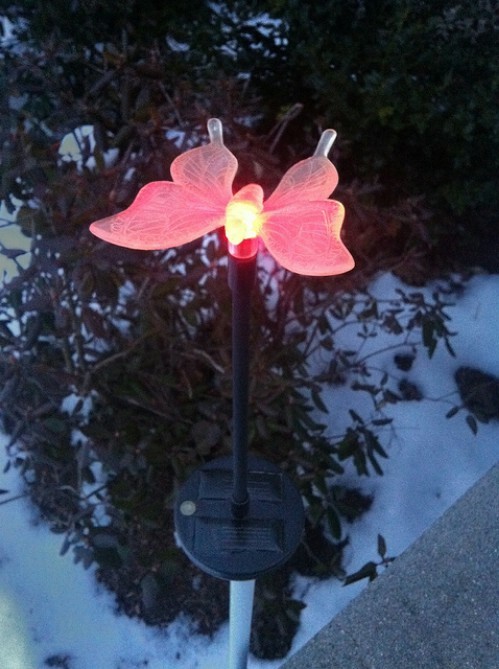 You can give new life to old solar lights with nail polish. That’s right, nail polish. Just paint the panels with clear nail polish. It will really make them shine and help them to glow brightly again. Those panels can become dingy and not work so well after a few seasons. Rejuvenating them with clear nail polish works perfectly and it’s much less expensive than replacing them altogether. You can pick up cheap nail polish at most Dollar Stores for around a dollar, and one bottle will do all of your solar lights. A metal bucket and lumber will enable you to create a lovely coffee table for your deck or patio and one that has additional storage for things that you don’t want to get wet in the rain. You can find an old galvanized bucket at yard sales, flea markets or thrift stores if you don’t already have one and the lumber is really inexpensive. You can also use any plywood that you already have on hand, which will make this little project cost absolutely nothing. You’ll have to cut the plywood into a circular shape and ensure that you get it the right size. Overall, this project shouldn’t take more than a couple of hours. If you have some fabric, you can use that along with pillow stuffing to create a wonderful quilt pillow for the backyard. You can use this when you sit under the stars or even for camping. You just create small pillows and then attach them all together. You could probably do this with small throw pillows if you already have some on hand but you can make it just as easy. Imagine being able to lounge in the sun or under the moon on a very comfortable and plush pillow quilt. You can use any number of materials to create a living tee pee and your children will adore playing in them. From bean poles to twigs, there are several things that can make up the base and then you just have to choose what you want for the cover. If you want to plant beans, this is a great way to give your backyard a little pick me up and grow some fresh veggies at the same time. You can also do this with flowers, which will look beautiful when they are blooming and give your yard a burst of color along with a playhouse for the kids. 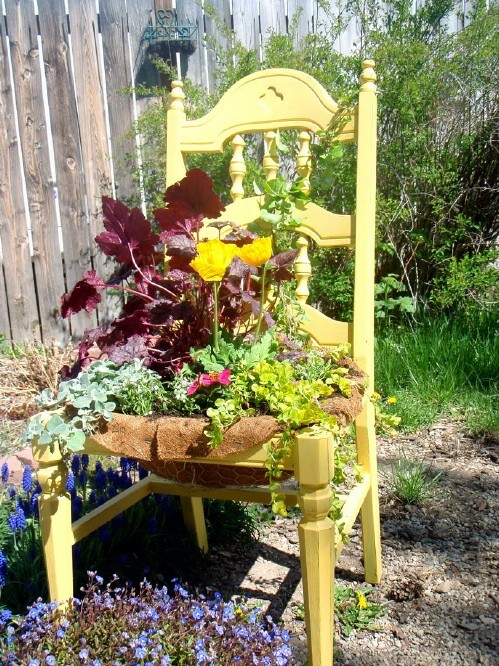 Old chairs, flowers and your backyard spell fun, color and beautiful outdoor décor. If you have some old wooden chairs that can’t be used any longer (if you don’t you can get them pretty cheap) then you just have to remove the seat and turn those old chairs into beautiful planters. 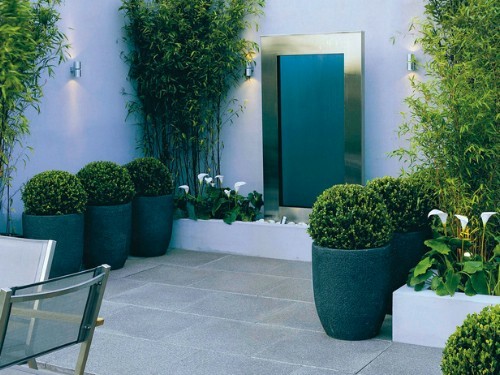 You can paint them different colors if you really want a lot of color outdoors and then add container plants that will bloom in contrasting colors. The chairs look great in flower beds, on decks and patios or just sitting in the yard under a tree. 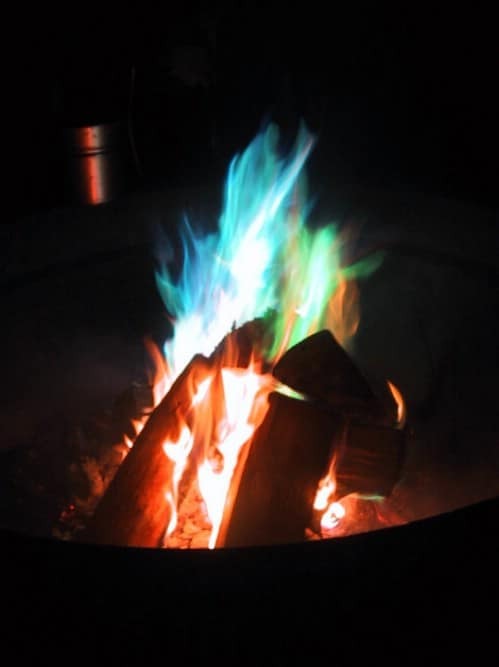 Pinecones, when treated properly, can be thrown into the fire pit to create amazing bursts of color from your flames. If you have a fire pit, this is an excellent way to add excitement for those nights when you are outdoors relaxing. Please note that chemically treated pinecones should only be burned when there is plenty of ventilation. The cool thing about this project is that different things make different colors so you can choose the colors that you want or just treat several and surprise yourself with your colored flames. You can build your own beautiful fire pit and have wonderfully relaxing evenings during the summer just sitting around roasting marshmallows. 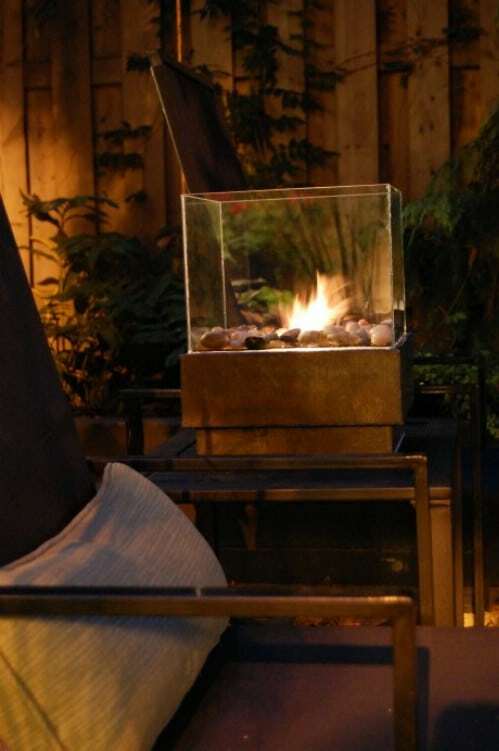 Fire pits are really not difficult or expensive, if you know what you are doing. This particular pit is made from brick but you could use any number of stones if you wanted. You can also place patio furniture near the fire pit or just have blankets and pillows on hand for those evenings when you want to really relax under the stars. 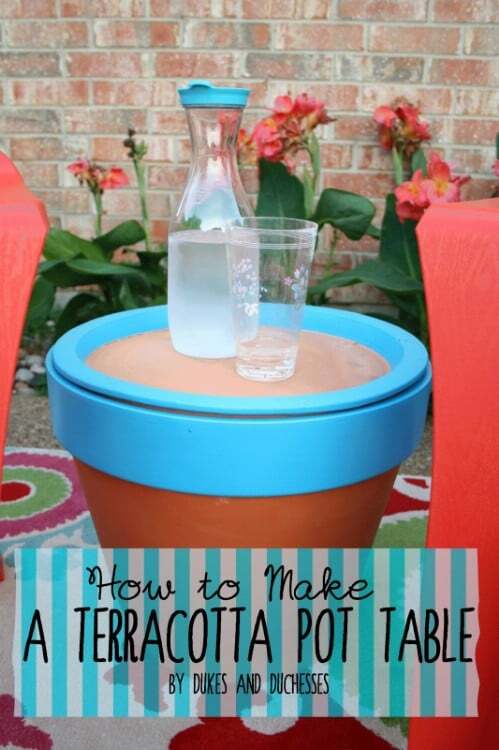 You can create a beautiful side table from a terra cotta pot, a terra cotta tray and some outdoor paint. The actual size of the table will depend on the size of the pots that you use. If you want a relatively large table, choose a large pot and tray. Once you have this all assembled, which doesn’t really take very long, you can use it for additional storage. Just lift up the top and put whatever you want to inside. If you have an old pot and tray on hand, this one won’t cost anything. 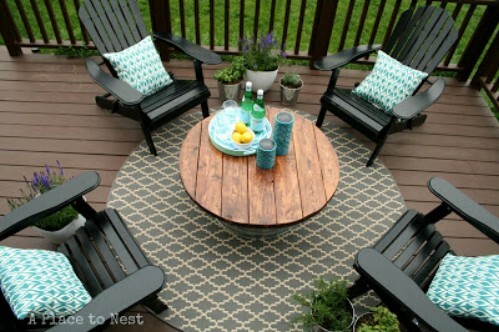 Even if you have to buy them, it’s still a really inexpensive table that is perfect for the backyard. A terra cotta pot, some old baskets or many other items you may have around the house can be used to create stunning outdoor lighting that hangs on the side of the house. 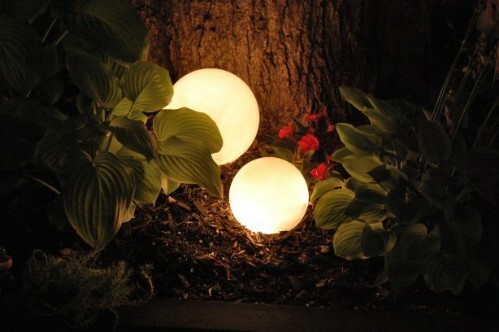 If your backyard is a bit drab and dark at night, these lights will really help to spruce it up a bit. The best part is that they are really easy to make and very inexpensive. In fact, everything you need to make them can be bought at your local Dollar Store. 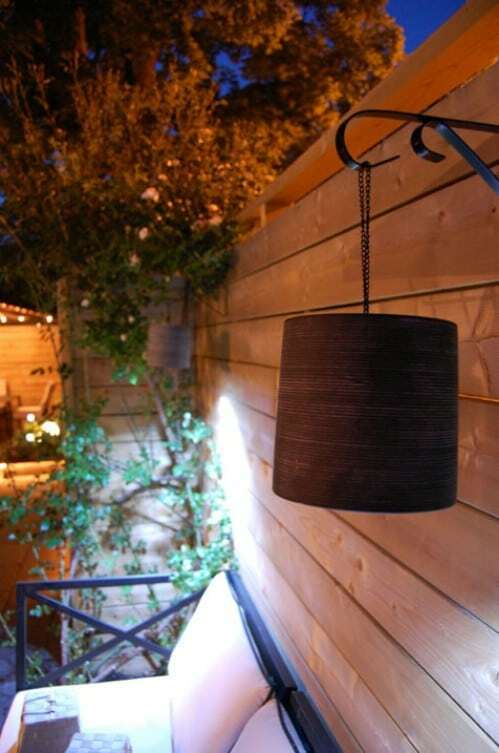 You can choose the style that you like best and then just create hanging lights that will instantly brighten up the backyard. Whether or not you enjoy the taste of rhubarb, there is no denying that the leaves are truly beautiful. They are also quite large which makes them the perfect choice for creating large stepping stones that you can place in the backyard. You can have a path leading off the back deck and into your flower garden or even place the stones in your garden if you want. They are really easy to make, inexpensive (particularly if you are growing your own rhubarb) and will look wonderful wherever you place them. Lanterns from tuna cans? Yes! These are so adorable and so easy to make. If you tend to eat quite a bit of tuna, just save the cans and the battle is halfway won. Incidentally, you’ll also need globes or hurricanes for the tops of the lanterns and poles to stick them on. 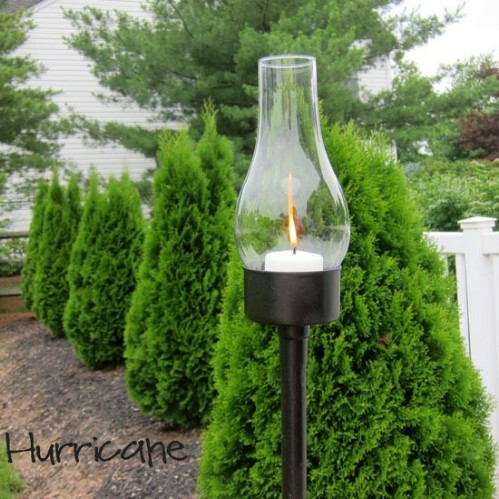 These are so great and will be beautiful lining a pathway in your backyard. You could also use them as lights on your back deck. When you are finished making them, just insert a tealight candle. During the summer, you could use citronella candles to light the way and get rid of bugs at the same time. Having a rope swing hanging from a tree in the backyard is a great sight. 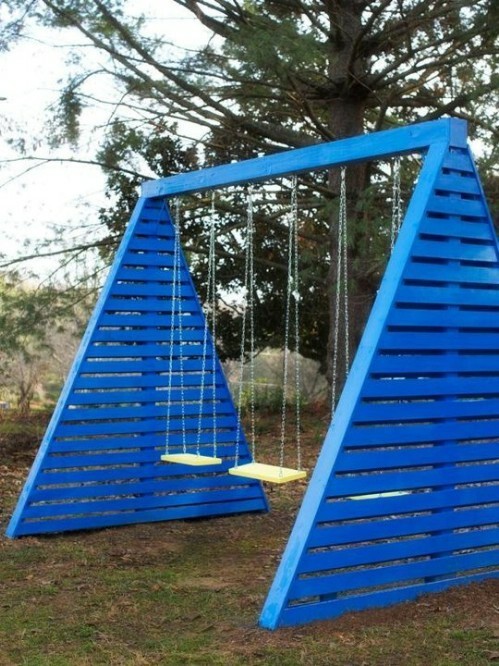 Your kids will absolutely love swinging on it, too. You don’t need a lot in order to make this swing, either. You need a pine disc cut into a circle which you can find at your local hardware or home improvement store – or you could cut one yourself. You will also need rope in order to hang the swing. Make sure that there is a hole in the center of your disc and then just knot the rope on the bottom and hang the other end over a sturdy branch. Imagine having an outdoor theater in your back yard. Why, you’ll be the envy of your entire neighborhood and only you will know how easy it was to create. If you have a projector, you’re halfway there already. Now you just need a screen and some comfy seating. You can get screen fabric for less than $40 per yard if you want or you could simply use a white sheet or tarp. 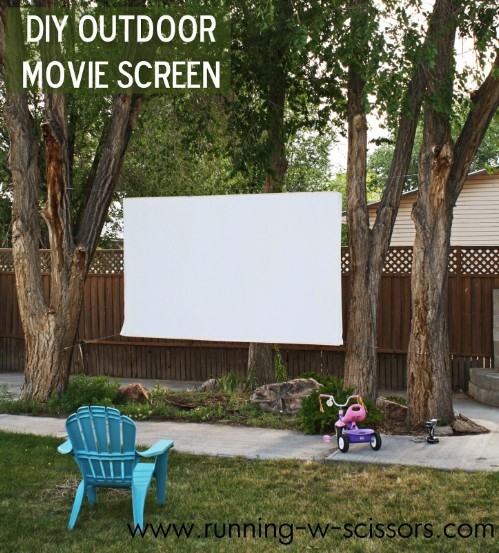 Then just hang the screen, add your pillows and get ready to spend a lot of time outside during the upcoming summer evenings. 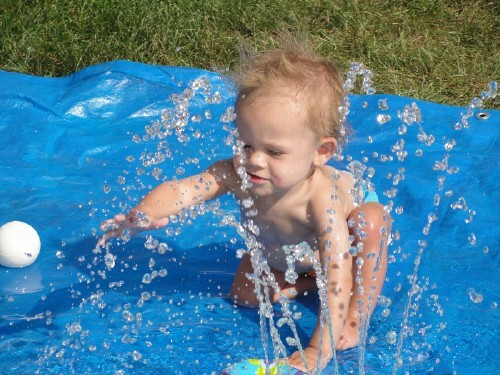 No, that’s not a type – you can add a wonderful water blob to your backyard and give your kids hours of fun this summer. A water blog gives the kids somewhere to jump and play without worries of actually being in the water and trust us when we say that they will love this. You can make the blob from painters plastic and if you take an iron to the edges before you add the water, it won’t leak. Just make it the size that you want, fill with water and then let the fun begin. One quick and easy way to increase the beauty in your backyard (not to mention add value to your property) is to edge your flower beds. You can do this easily yourself and save a small fortune over professional edging. Even if you’ve never done it before, you can lay concrete pavers and finish them off, giving your flower beds a professionally edged look and making your entire backyard look great. Take note, this is so easy that you will likely want to do it in the front yard as well. What’s the perfect chandelier for a backyard deck? One made of Mason jars, of course. Not only is this project easy, it’s also very inexpensive. You need some canning jars and you can use older ones in different colors if you want. Then just add a string of clear lights (some leftover from Christmas decorating perhaps) and you have a beautiful light for your deck. You could also hang this on a pole in the backyard if you need lighting a bit further away from the house. Imagine having your favorite flowers lit up after dark. These glow in the dark planters are gorgeous and really easy to make. Do you want to know how simple they are to make? You literally just need planters and glow in the dark spray paint. 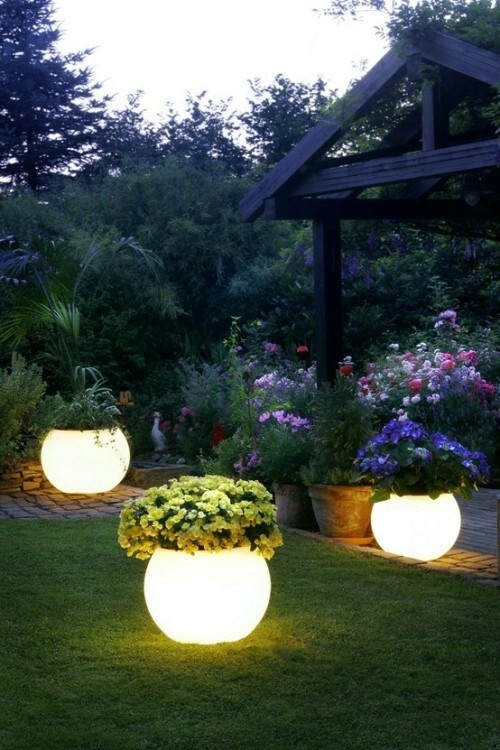 You can finish a single planter in about half an hour so even if you have several areas in the yard that you want to light up, you can do it all in one day. Use planters that you already have on hand and the project will only cost a few dollars for the can of paint. 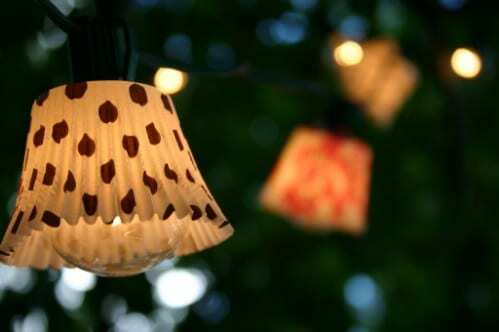 If you want to really brighten up those outdoor parties, or just add a festive touch to your deck lighting, these paper bag lights are perfect. You need some paper bags (which you can get at most Dollar Stores for around a dollar for several), some clear lights and some tape and ribbon. You can decorate the bags or purchase colored ones, whatever you want to do. If you are planning to host a lot of cookouts or pool parties this summer, these lights are the perfect inexpensive way to really brighten things up. 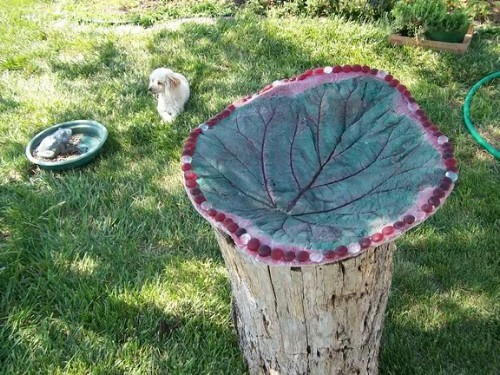 A bird bath in the backyard will instantly add beauty to your outdoors and you can make your own in a wonderful leaf shape that the birds will love. 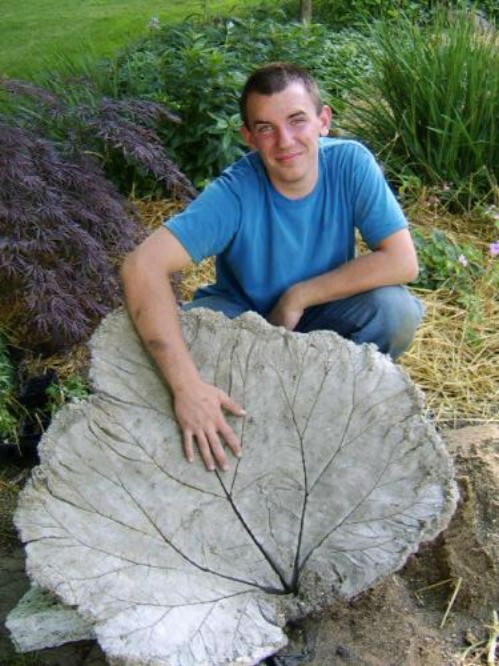 You will have to choose a leaf and the size of your bird bath will depend on the type and size of leaf that you choose. Once you have a leaf, it’s all about the concrete and drying process which shouldn’t take more than a day or so. You can attach this to a base or honestly, they look beautiful just sitting in the garden. This DIY planting board is not really going to make your backyard look better per se, but it will help you to create perfect rows in your garden which will make the yard look better. You need a few old corks, a board and some screws. The planting board is so easy to make and you probably have all of the supplies that you need already. Once it’s finished, you just pick it up and press it into the ground with the corks facing into the dirt. 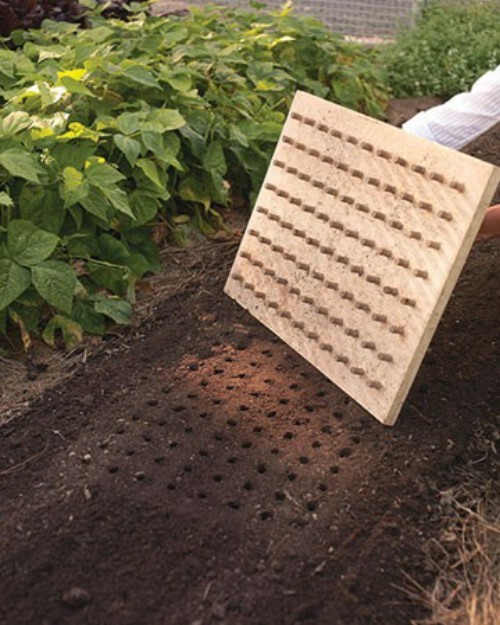 It will help you to create perfect rows for your veggie and flower gardens every time. If you have a swimming pool, this towel rack is a must for summer. It’s made from PVC pipe and is really easy to put together. Plus, it holds multiple towels so there won’t be any worries of towels being lost or misplaced when swimming. You only need PVC pipe, a hack saw and T fittings for the pipe. Make sure that your fittings are the same size as the pipe that you choose. 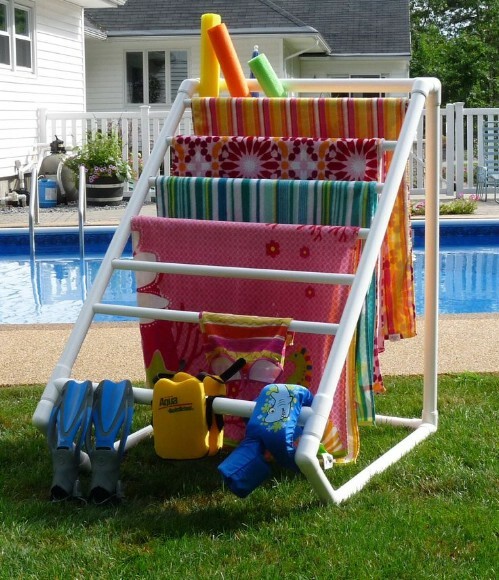 Not only will it keep towels organized while you are enjoying the pool, it’s great for drying them afterwards as well. Nothing beats sitting outdoors at night and admiring the stars on a warm summer evening. Nothing except having your own observatory that is. If you have a star gazer in the family, this is the perfect summer DIY. It lets you create a beautiful place for admiring the stars and it’s a really cheap way to do it. 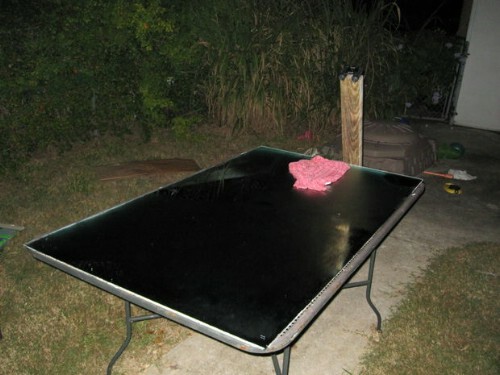 You simply create a mirror table that allows you to see the stars up close and personal. This is such an easy project and one that is sure to be a huge hit with everyone in the family. Yep, diaper them. If you have planters hanging from the back porch or deck, they are sure to leak from time to time, leaving you with unsightly wet spots everywhere. A better way, and one that actually helps to keep your plants healthier, is to add a diaper to the planter before adding the plant. The diaper will soak up water, ensuring that there are no leaks. The diaper also holds the water so your plants will not become dry as quickly, which makes them look healthier and more beautiful and ultimately makes your backyard more attractive. If you want your birds to be happy and you want your backyard to be beautiful as well, give your little feathered friends something beautiful to build their nests. What you may ask? Colorful yarn, of course. 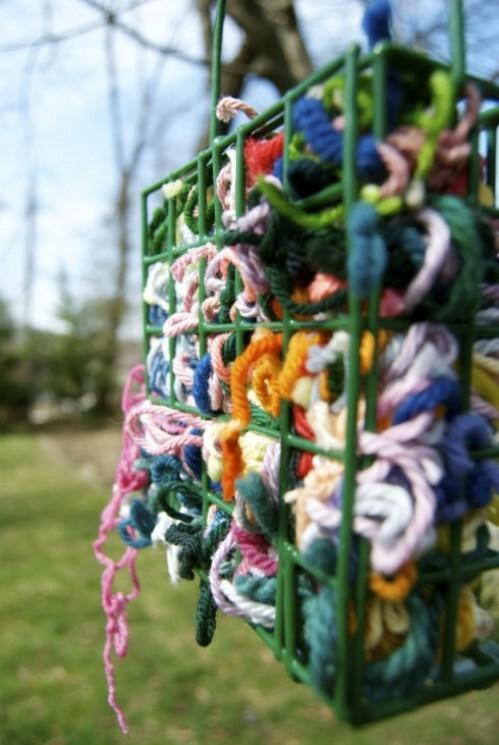 You can set up a station for birds to gather colorful yarn that they will then take and use in their nests. Not only does the yarn station look good, the nests that your little birdie friends build will also look good. And, this gives you a great way to get rid of bits of yarn that you will never use. 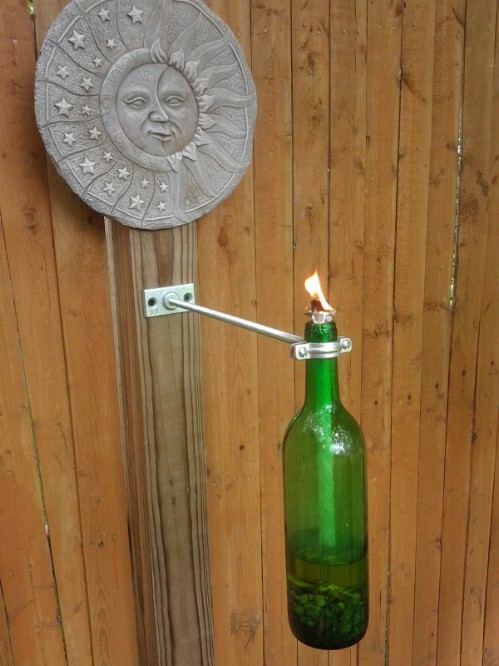 Create beautiful tiki torches for the back yard from empty wine bottles and have a great way to recycle those bottles at the same time. You need an empty (and cleaned) bottle for each torch along with a tiki torch refill wick, citronella lamp oil and a metal washer to hold it all together. You will also want a collection of decorate rocks or beads just to make them pretty. These are beautiful on outdoor tables and will help to keep the bugs away during your cookouts. You can place them directly on the table or use clamps to secure them to the porch or deck. If you have a garden in the backyard, you can use mirrors to make that garden seem larger. 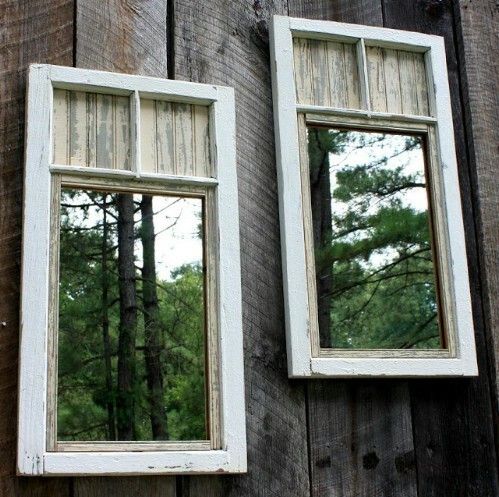 Alternatively, if you don’t have a garden, mirrors will make the garden in the front yard stretch to the back yard. You can fashion mirrors from old windows which you can pick up at yard sales or flea markets for a couple of dollars each. Then just clean and paint them if you want and add the mirror sections. These are great for adding greenery where you may not have room to actually plant. There is no better way to cool off in the summer than with a DIY splash pad. Not only does it provide great cooling water for the kids, it’s easy and very inexpensive to create. Instead of spending a small fortune buying a splash pad, just make one yourself. You actually just need a large tarp and a sprinkler. 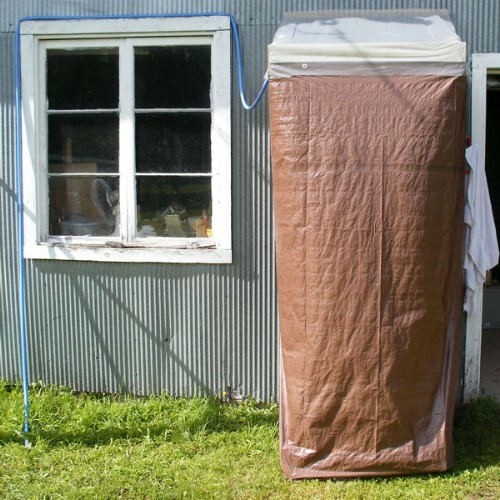 Make sure that the tarp is not ripped or torn and if you have a kids’ sprinkler, that may work better than one for the lawn. Kids will have a blast playing in the water and you could add an additional tarp for a DIY slip and slide. 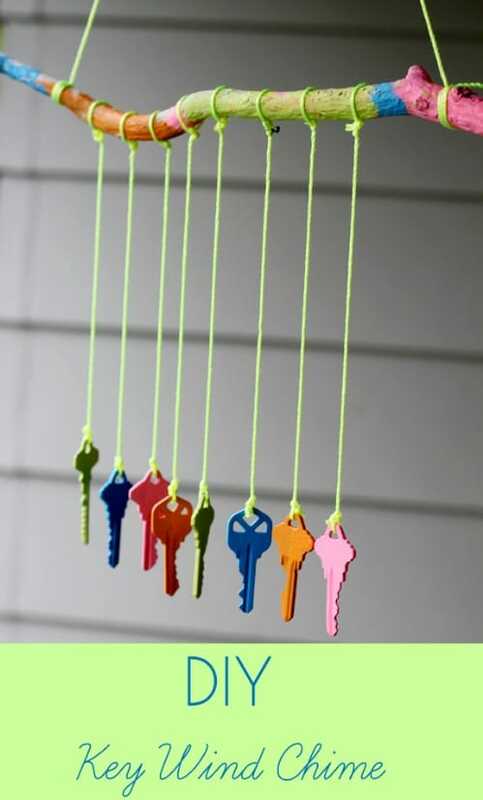 Take those old keys (you know, the ones that you have no idea what they go to) and turn them into a beautiful and colorful wind chime for the back porch. You just have to gather up old keys, paint them in different colors and then attach them to a base with yarn. You can use a large twig for the base that is also painted to really give it a colorful look. Choose yarn colors that will contrast with the colors of the keys to make it a bit more interesting. This is an easy (and completely free if you have the keys) project that will instantly colorize your backyard. Whether you have a little football or softball player in your midst, this passing game is a great backyard addition. Not only will it help them with their throwing and tossing, it gets them outside for some fresh air. You need a water resistant tarp with grommets, rope, colored duct tape, permanent marker and a ruler to create the game. You can choose to make it a passing game for football or if you prefer softball, make the holes a bit smaller if you want. 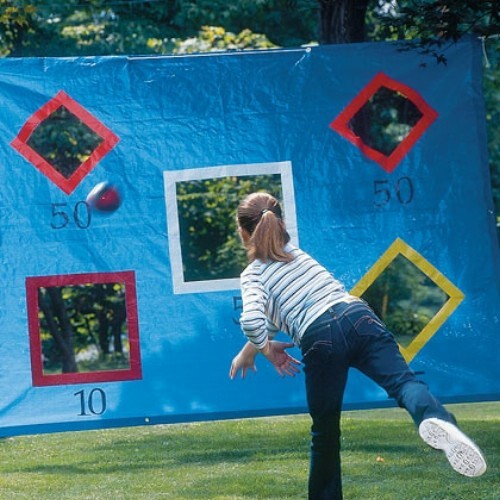 The kids are sure to enjoy passing and this is a great game for outdoor parties. Outdoor games are a must for summer fun but that doesn’t mean that you have to spend a fortune buying them. This life size croquet set is made from inexpensive pool noodles and is great fun for kids of all ages (even adults). You need to cut the pool noodles in half right down the middle and then again to make two arches from each half. Garden stakes will keep them in place. Then just grab some kick balls and let the fun begin. Kids will adore playing croquet kick ball style and it’s great exercise. If you need stepping stones for your backyard patio or walkway, get the kids involved and let them help you to create these beautiful stones that feature colorful glass stones. You can use anything you want for a mold – old cardboard boxes work really well. 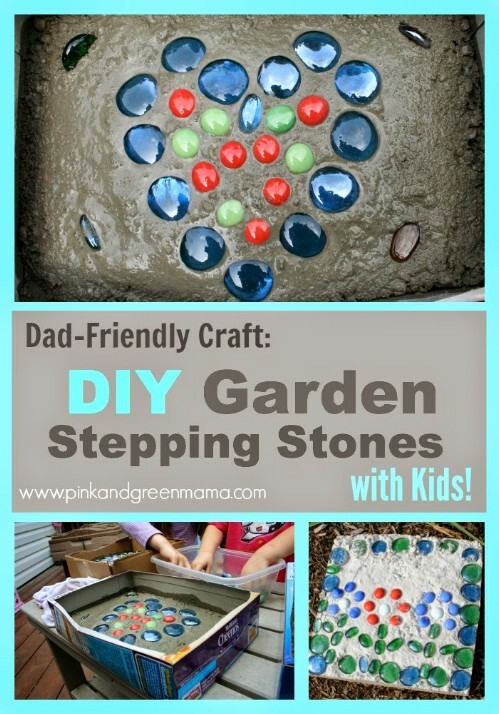 Just make sure an adult is available to mix the concrete and then the kids can place the glass stones in any design that they want. This is a great summer project for the entire family and one that will help you to spruce up the backyard just a bit, too. Honestly, what would kids love more than their very own tree house? You can build one and it takes much less time than you may think. 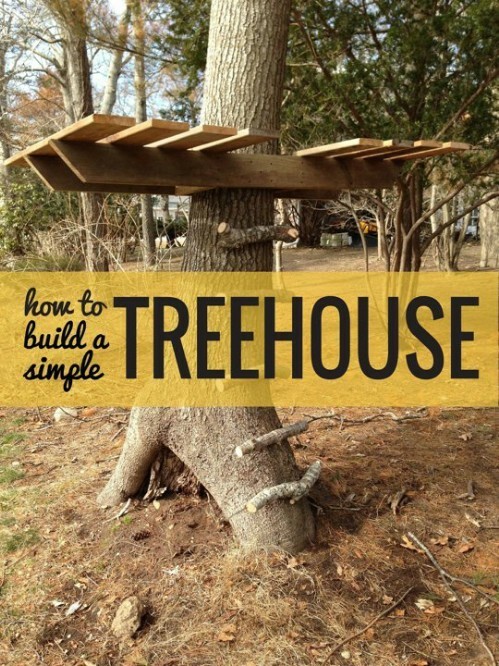 You don’t have to be a professional contractor to build your kids a nice little tree house and one that uses just a few materials. You can even make the ladder from logs or branches so you save just a bit on the lumber needed for a ladder. Kids will adore playing in their tree house and you will have given your backyard just a little something extra without spending a fortune. A pizza oven in the backyard? Yes, please! Imagine having a pizza oven just outside, one that you can use during the hot summer months so that you don’t have to bake those pizzas inside and heat up the house. This is a really simple project considering that you end up with an authentic pizza oven. 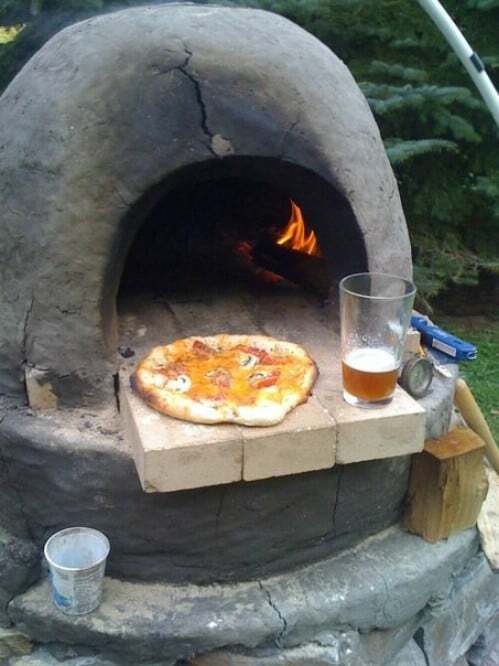 What a great way to increase your backyard appeal and have the perfect place for making delicious pizzas at the same time. It does take a few materials but you may have most of them on hand already and if not, they’re really not that expensive to purchase. And did we mention that you end up with a pizza oven in the backyard? 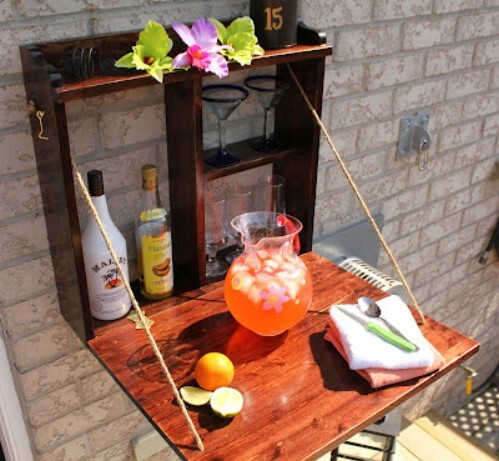 Even if you don’t tend to enjoy a cocktail every now and then, a backyard bar can be a great addition to any home. If you aren’t a fan of cocktails, you can just use it to serve lemonade or sodas. This one is great because you can close it up when you are not using it and it doesn’t take up any room at all. It affixes to the side of the house, which saves even more room. Imagine having a bar ready for those summer get-togethers. This one will really help you to enjoy the backyard. Oh, IKEA hacks, how we love you. 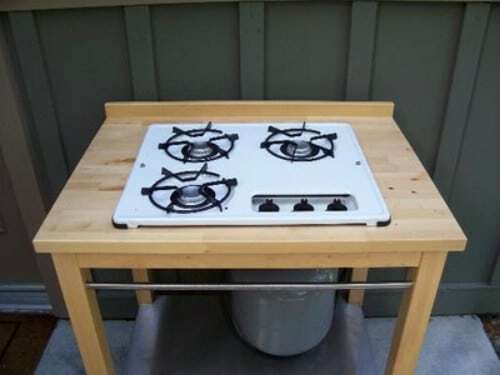 This wonderful IKEA hacks enables you to build a stove for an outdoor kitchen. Don’t have an outdoor kitchen? You can start one with this easy to build stove that is really inexpensive, particularly considering what an actual outdoor stove will cost you. It actually begins as a Varde sink unit that is converted to a gas stove, which is perfect for cooking out and enjoying the outdoors. Just add a sink and a small fridge and you have a wonderful outdoor kitchen. Giving the kids a special place to play, and one that offers privacy, is a great way to get them to spend some time outdoors. 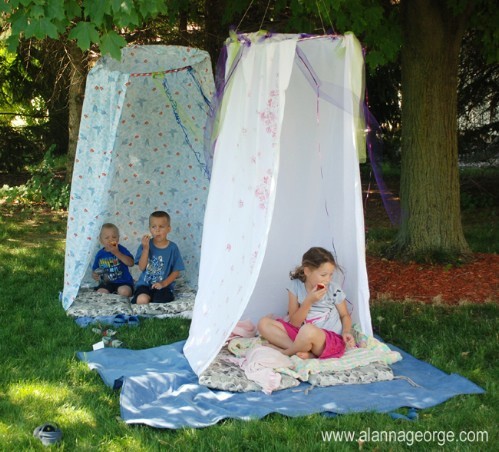 You can create wonderful hideaways with hula hoops (which you can buy at the Dollar Store for about a dollar each) and some old sheets. You just have to loop the hoop through a tree and then add your sheet to the top to offer cover. Not only does it give them a secret hideaway of sorts, it offers great shade so you have fewer worries of them getting too much sun during the hotter part of the day. If you don’t already have a sandbox, you need one. Really, they are so easy and inexpensive to build that every home should have a sandbox. Imagine the fun that your little ones will have when you make this for the back yard. You just need two pressure treated pine boards to create a good sized box and you can use leftover pieces from the boards to create benches where the kids can sit while they play. 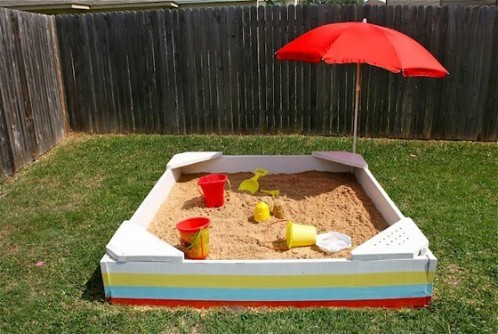 Paint your sandbox in whatever colors you want and add a decorative umbrella for shade during really sunny days. 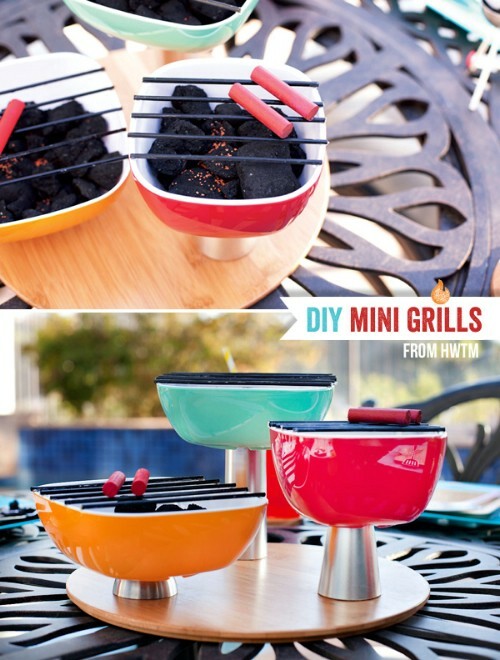 Mini grills are wonderful. You can put them right on the patio table and sit and relax while you cook. Or, you could allow everyone to cook their own food, giving you the night off completely. These are perfect for smaller cookouts when you have just a small handful of friends and family over or if you really wanted to create several, you could use them for larger get-togethers as well. This particular one is a centerpiece that features three mini grills and it’s perfect for the backyard patio. Ah pallets. They are perfect for just about any building and DIY project. 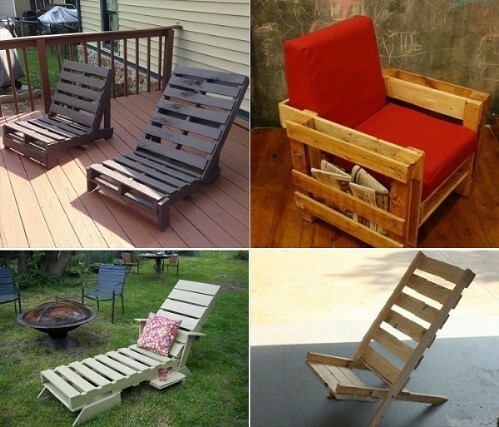 If you need lounge chairs for the back yard and you have a few pallets sitting around going unused, you can build wonderful loungers from those pallets. This project is great because you can usually get pallets for very little to nothing and you can do the lounge chairs in just about any style that you want. They are great for laying outside and soaking up the sun or you can use them on the deck or patio. You really can lay an entire patio in just one weekend. You’ll need a few materials and a weekend to spare when the weather is cooperative – meaning that there needs to be plenty of sunshine and absolutely no rain. You begin by marking off where you want the patio to go and then just level the area with sand and begin adding your patio pavers. This may not be the least expensive project on your to-do list but it is certainly one that is going to give your backyard an entirely new look. 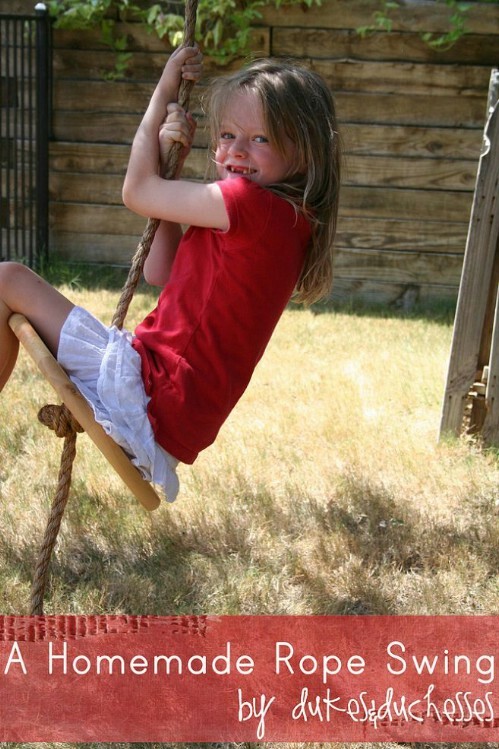 Swing sets are a must for backyards and if you don’t have one (and don’t want to buy one) you can easily build one yourself. If you prefer the modern look, this is a great project for your back yard. The swing set itself has a really neat contemporary look that can be painted any color to match your preferences. It’s in an A frame design and holds as many swings as you want it to depending on how wide you make it. If you need a swing set and you want to save money, this is a great project. 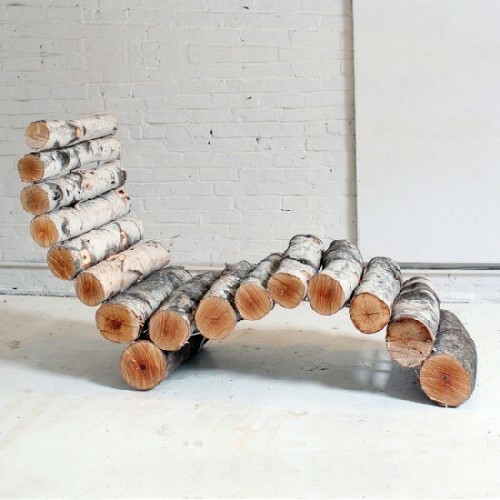 Really, you can turn yard waste into a very unique and comfortable lounge chair. You need a few logs, which you can get by cutting down trees that you want removed or just pick them up from the yard if you have them. Not only will this give you much needed seating in the backyard for those outdoor get-togethers, but it’s one that is completely unique and beautifully rustic. 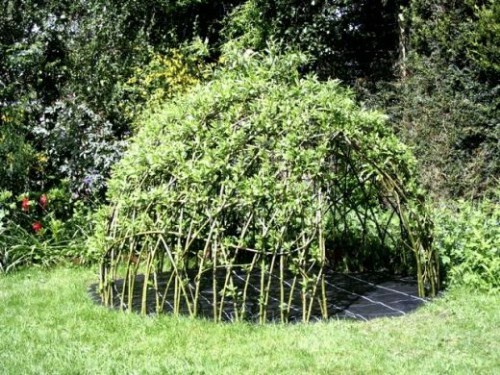 You can build one in just a few hours so make as many as you have the materials for. You can add cushions to them if you want but they are great just by themselves. 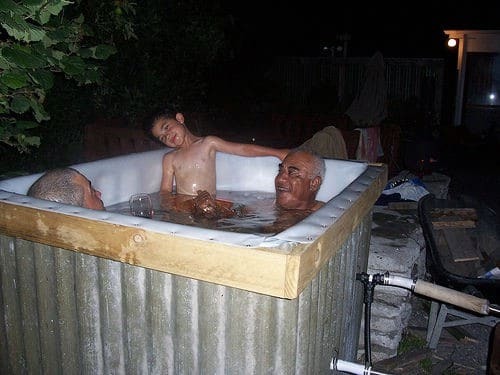 What could possibly give you more joy in the back yard than a hot tub? This one is a DIY hot tub and one that is fueled by wood so there is no need to run electricity or have a gas outlet. You can build it for less than $100, which is a lot cheaper than buying one and while this one won’t have the Jacuzzi jets that you may want, it is certainly going to improve your backyard appeal. You can heat up the water or leave it cool for a refreshing dip during the hotter part of the summer days. A pergola will instantly improve the look of your deck and make your entire back yard seem more interesting. And, it’s something that is really easy to build and probably much less expensive than you may think. 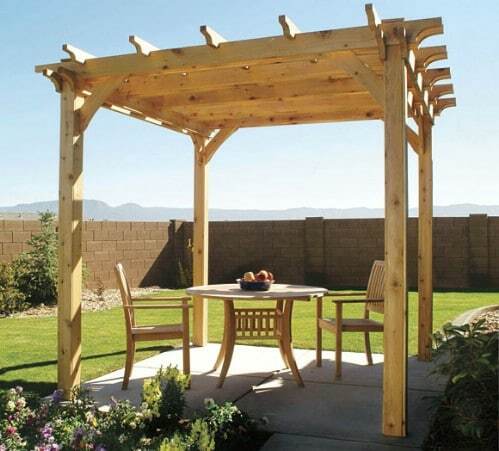 Of course, you could always hire someone to build you a pergola but why spend money that you don’t have to spend? 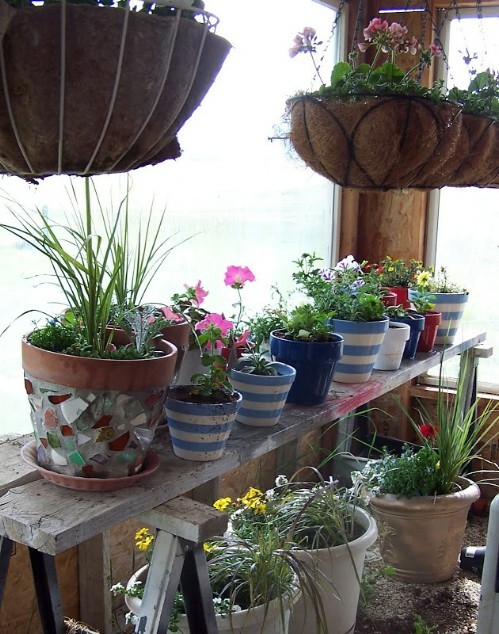 You can have plants vining up the sides, hang baskets on the side with plants or dress it up with clear lights. It’s a great choice for improving the look of your deck and adding a focal point to the back yard in general. 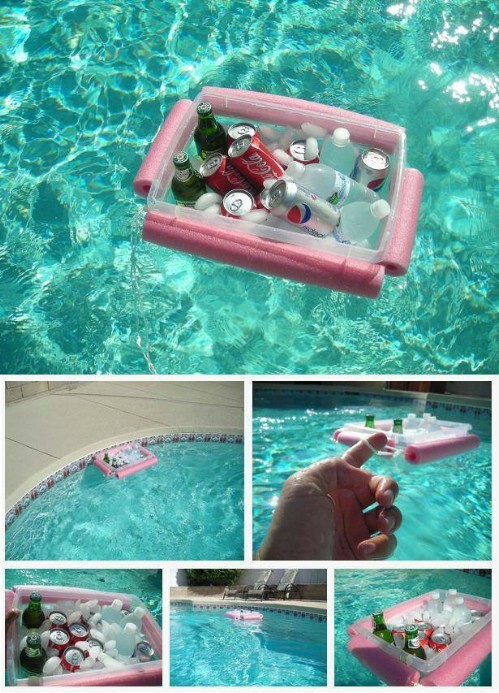 If you have a pool, a floating cooler is an absolute must for summer. Granted, you could always buy one but you can make one just as easily and a lot cheaper than purchasing. 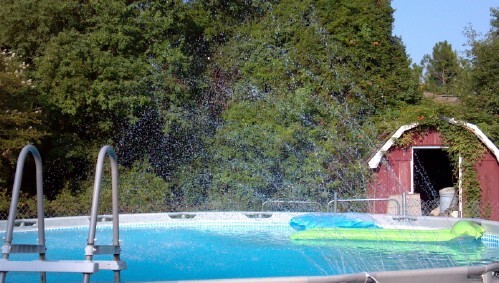 You need pool noodles to make the cooler float and they are really inexpensive. You can actually make this entire cooler for less than $10 (compared to more than $25 to buy one) and it will allow your drinks to float alongside you in the pool so there is no worry of having to get out of that nice cool water in order to quench your thirst. If you have a swimming pool, you know that the water temperature is not always perfect. While you may want it to be a little cool in the summer, no one wants to dive into ice cold water no matter how hot it is outside. 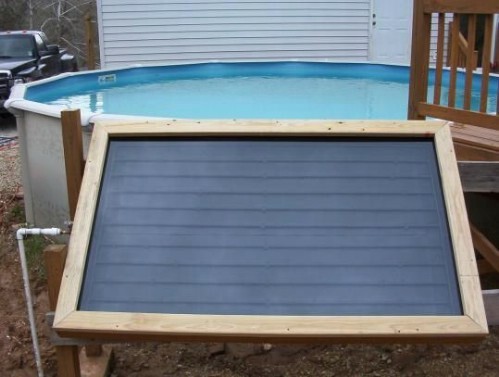 You can remedy that problem by building your own solar panels that will heat your pool without needing electricity. The great thing is that this is made from common materials that you may have lying around the garage so it likely won’t cost anything and it will ensure that your pool water is always the perfect temperature. If you think that maybe the trampoline is not really safe for little ones, there is a way to make it safer and a bit more attractive as well. 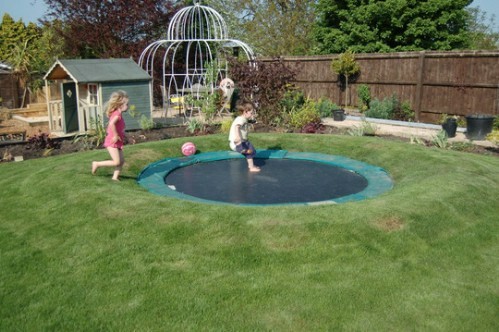 Imagine a sunken trampoline that takes up literally no space in the backyard and is perfectly safe for little ones. If they fall from a sunken trampoline, they won’t fall far. All you really have to do is to create a hole the perfect size and drop the trampoline into it. No one will be able to even tell you have a trampoline unless they are standing in your backyard and it’s much safer for the kids this way. This is such a beautiful idea and one that is sure to make your backyard the envy of your neighborhood. 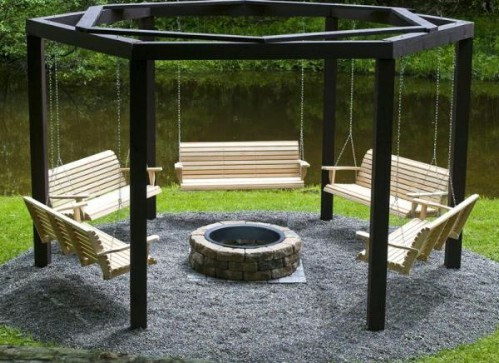 Imagine having multiple swings around your fire pit. You can entertain several friends at once and have a place for everyone to sit or simply relax and enjoy the peace and quiet all by yourself. This is a great idea and one that doesn’t take nearly as much time or money as you may think. If you have a fire pit, or you are planning on building one this summer, consider putting swings around it for added beauty. Having a fire pit in the backyard is great and all, but what about up on the deck? You can create little mini fire pits for the deck that are beautiful and really inexpensive to build. In fact, it costs only about $25 to build one of these and they are so portable that you can have one on every side table on your deck. Or, just make one to use as a centerpiece for your outdoor dining table. It is sure to brighten up those outdoor spaces and you can choose different colored stones and other accents to make them match your existing outdoor décor. 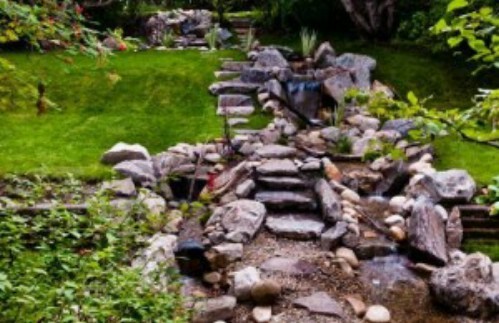 If you have a downward slope anywhere in your back yard, this is the perfect place to build your own little stream. You don’t have to live near a river in order to enjoy the sound of trickling water and a stream is such an easy thing to create. You will need to gather a few rocks or stones, which you can get around the yard or near a river if you have one close by. 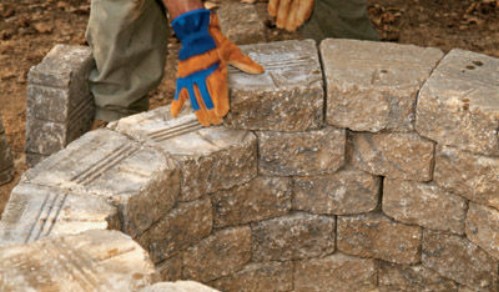 Make sure when digging that you aren’t anywhere near utility lines that are buried in the yard and use different decorative elements to make your stream unique. No, you don’t have to buy a swimming pool fountain. You can actually build one yourself and one that works perfectly, just like a store bought one. Actually, this DIY fountain is better because it costs much, much less than one that you can buy at a pool store. It’s made from PVC pipe and you can make it float around in the pool and give off cooling sprays while you are swimming. Or, just have it flowing when no one is in the pool. Not only does it look beautiful, it can help to keep your water moving so there is less worry of algae buildup. 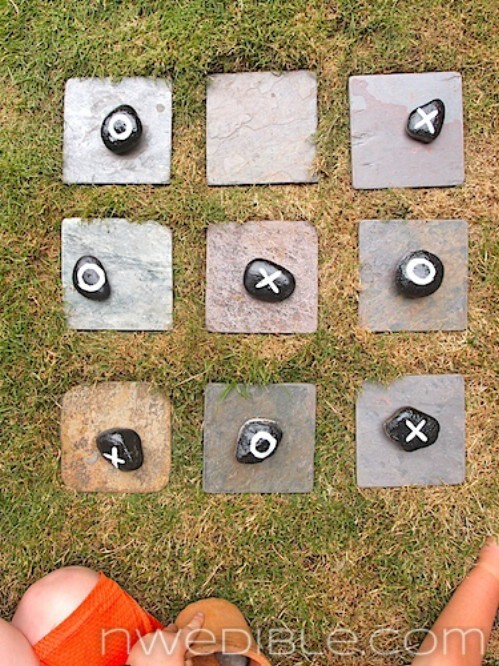 Kids and adults alike will have hours of fun playing with this outdoor Tic-Tac-Toe game that you can make yourself from painted rocks and patio tiles. You simply spray paint the rocks or stones black and then add the Xs and Os to create the game. The patio tiles or pavers work as the base for the game and you can store everything in a terra cotta pot on the back deck when the game is not being played so that there are no worries of pieces being lost. A hammock is the perfect place to relax in the shade. If you don’t already have one, you simply must add one for summer. You can do so the DIY way with this easy to make hammock that is sure to bring you hours of relaxation and fun. 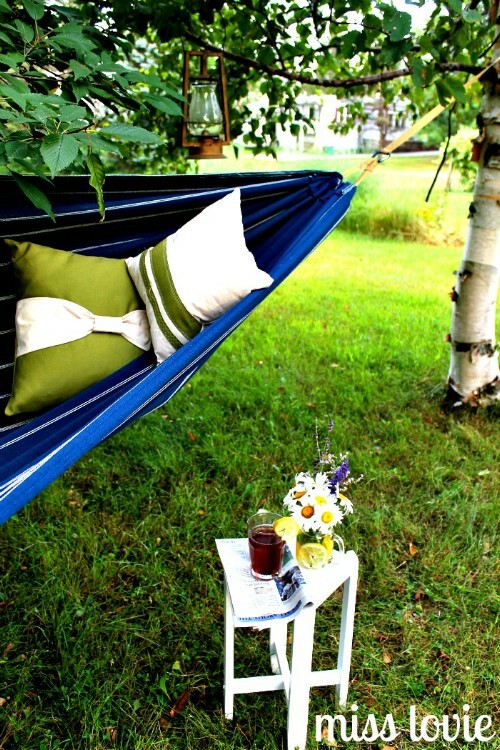 You really don’t need any special type of fabric and you can embellish the hammock any way you like. Add a few pillows to make your naps much more comfortable and even a small side table to hold drinks and other items. That’s green as in plenty of greenery and flowers. Birdhouses by themselves are great for adding beauty and a natural element to the back yard. When you combine that with plants, you get a double dose of nature that is really great. 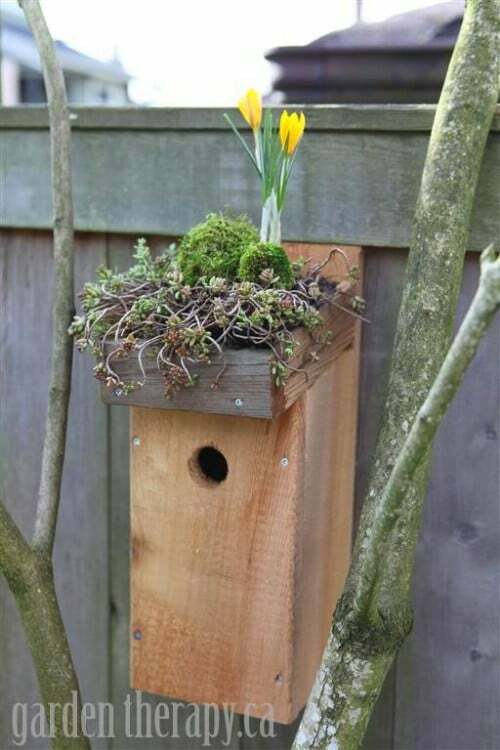 You can easily build this birdhouse that features a little garden area on top that is perfect for smaller plants and flowers. Whether you want something really colorful or you prefer greenery alone like succulents, this is the perfect way to add a little beauty to the yard. 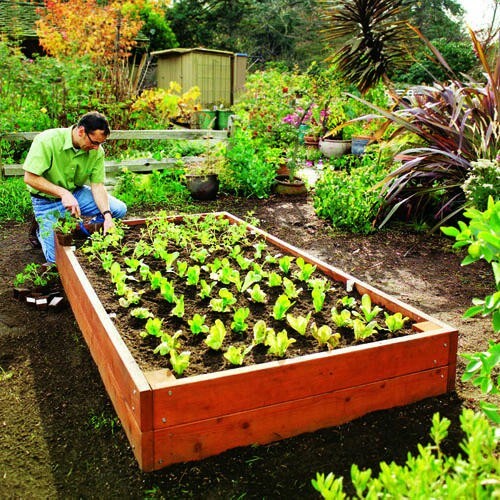 Raised garden beds are perfect for backyards, particularly those that don’t really have a lot of planting space. The raised beds can be placed just about anywhere and you can make them in a number of different designs. If you are planning to have a vegetable garden but you want to do something that will decorate the back yard a bit at the same time, raised beds are the perfect solution for both problems. You just need lumber to build the bases and you can do them in any size that you need. If you have a pool, an outdoor shower may be something that you have considered in the past. Unfortunately, they can sometimes be rather expensive. You can however, make your own and one that is solar powered so you won’t’ actually have to run the water from inside. You can hook up your garden hose and heat the water before you get in by using sunlight. If you really want to save money, you can even use your solar shower for normal showers, although this will depend on how closely your neighbors are located. Believe it or not, building a miniature golf course is easy and won’t cost near what you may be thinking. You can build a complete course in just a day and your family will spend loads of time outside if you have putt-putt golf out there. Be warned however, that if you build it – they will come. You may find yourself with guests at every turn simply because yours is the only house on the block with an actual miniature golf course in the back yard. But, imagine the fun that you will have. I enjoyed ur ideas,especially the one with the pipe. Thank you. Looking forward to more ideas with DIY. At last! Something clear I can unsredtand. Thanks!